Good picture today of the first day of week service on the new timetables A-line and first pictures in Cremyll. Yesterday the new All Cornwall bus timetables were released and the timetables I am happy to report are now a lot better. 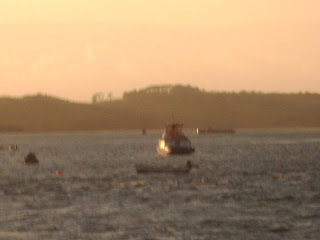 The connections with the ferry is even better than the times that 81B and 80B used to do and are at much more convenient times with better links with the ferry. 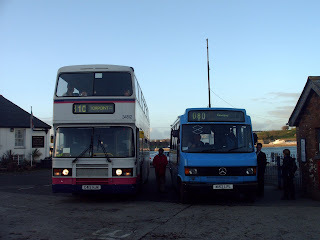 For example my buses the old 0830 and 1615 which I couldn't get becomes 0827 and 1633. This will mean 30mins wait in the morning for the ferry but much better links in the afternoon and throughout the day where buses leave Cremyll at --56/57 minutes past. This means very good connections for both ways of traffic. But this does mean that again A-Line Travel are being forced into competition with First as they both run the afternoon bus at very near the same time. A-Line Travel leave first ahead of First at 1630 and First last at 1633. This will mean that most of the traffic going to Millbrook will use First and Cawsand traffic which will most likely just be me will use A-Line. This will mean the same battle as many years age but companies leaving at the same time. This therefore again could mean that A-Line could be forced out of the equation once again. Though some people may still choose A-Line because A-Line is near a pound cheaper than First are. And if Jim drives fast he could still likely beat First by driving fast which Jim doesn't really like doing but he could likely beat first still. Especially as First are using the Olympians on that route. I'll give you the results to see how the timetable is going as soon as a get news from the drivers. Sorry I haven't psted for a few days been busy with other things. 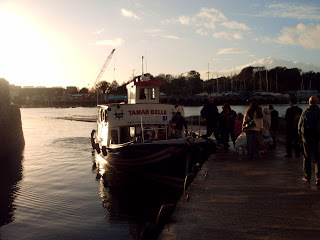 Northern Belle was taken out of service at Lunch time today marking the start of operation for Tamar Belle on the Cremyll-Plymouth route. The Northern will now go in for refit at Voyager Boat yard and undergo her yearly refit including painting and maintenance. This will continue until the Spring of next year. But for now Tamar Belle will ride the waves. And rock too. Over the past two days there have been major bus shortages at Torpoint because of so many buses braking down. There has been three Tridents out of action but today returned to 2 out of operation. Just one Leyland was working this afternoon after 34813 had a breakdown at Tregantelle Fort yesterday meaning she was out of action today and today 34809 broke down in Antony. The dart has not been sighed by me the whole time no I don't know weather she is in service or not. 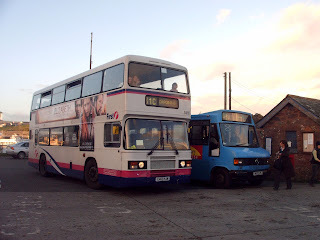 This meant that there was only the Volvo Olympian usually the least reliable, three Tridents, two Leyland Olympians and what turned out to be the workhorse of the day five Mercedes Varios. As I have called it the Vario revival. The three Tamar Link Varios were operating along with two Marchall Varios from Plymouth here to cover from the breakdowns. This could continue throughout the week until it gets fixed. But the Varios have been running to full capacity and many people have had to be refused to get on by the drivers as they just didn't have any more room. 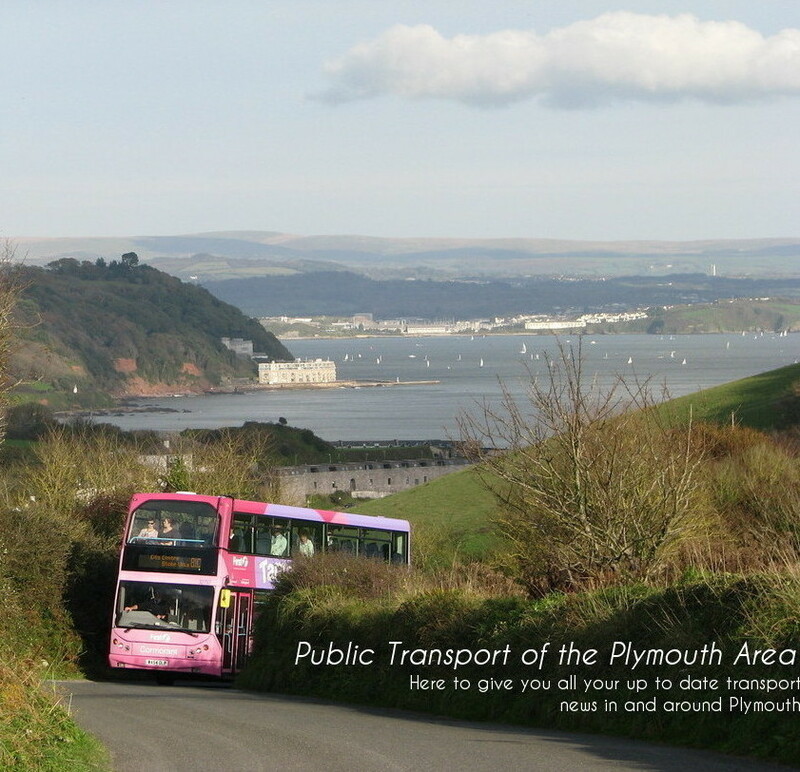 The picture above shows the crowding on 50306 on 81C in Torpoint going towards Plymouth. I've said it before and I'll say it again. They should have kept the VRs. The first of the Newly branded Tavylinx buses has been finished. This bus has been down here for a while and is fleet number 40570 YJ51 PZZ. 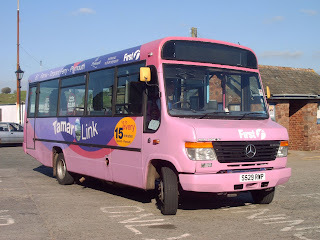 Again the route branding for the bus has been done into Pink and Purple nearly the same shade as is seen with Tamr Link but is done in a different pattern. The photo linked at the bottom was taken by Derrivk Cuff yesterday. 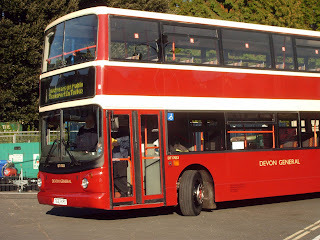 The bus will hopefully go into service the start of next week though could be earlier. 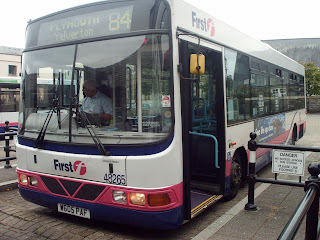 First Devon and Cornwall route 83 and 84 are very well used routes operating a service between Bretonside bus station and Tavistock. 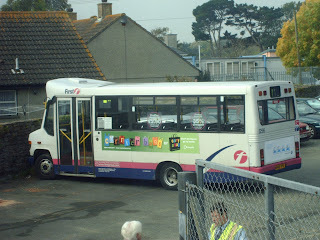 Well last week First Devon and Cornwall Managing director Marc Reedy says we will be getting seven 51 reg (2001) Volvo B6BLE’s (pictures on the cover coming) down here from York and will be painted into a new branded livery expected to be much the same as Tamar Link and Mayflower Link in design instead of the now phased out colour routes e.g. blue 7. This livery will be branded as Tavylinx which will be applied to the newer seven buses. To come with this the frequency will be increased from the current 20minuite gap down to every 15 minutes. STOP PRESS: The buses should be fleet numbered 40580-40586. These should be an all over livery and not just vinyls. And was also heard 40570 is already down here and may have been rebranded? 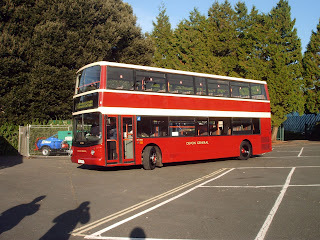 News on ex-Torpoint Leyland Olympian now serving in her last years down in Penzance has been spruced up again. 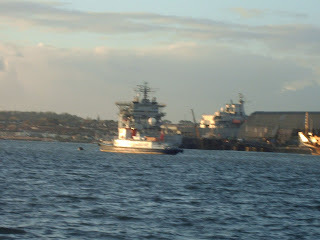 Only about two years ago she was re-painted and cleaned out when she came down to serve in Torpoint. Well she was had another re-paint but sadly looks the same as all the other Olympians as the depot down there haven't bothered to paint her grill like they did in Plymouth. I think you'll agree it doesn't look as good as when the grill was white. And they have given the interior a general clean up and is looking fine in her last days of service. Well at least I presume that theses are her last years. Same with all the Olympians. Problem is what they will replace them with when it does happen. There are plenty of disused step entrance Darts and Varios but they do need some double deackers. Who knows. They might just have to keep them going. Should have kept the VRs aswell. Not quite public transport but just had to post this. Such a good song. Sorry for the lack of updates I have had problems with the camera uploading. 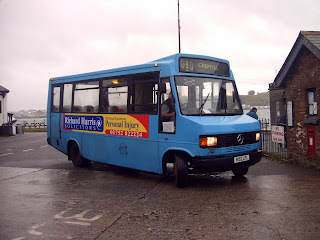 Saturday saw Marshall Bodied Mercedes Vario 52596 taken to Torpoint to help out on 181 dutyies. But I came into Plymouth at about 10:50 we passed the depot and was sitting there and on the return journey on the 2:30 from Plymouth it was still there. No need for it really. A-Line Travels Mercedes 709 has received her first branding for about ten years since she changed hands to Brigg's coaches. This was done in the form of local solicitor Richard Harris which also was done on the sidea of the old Ivecos (J234 KDL and J238 KDL) which I will pick up on as soon as I find out more on there current position. Anyway as you can see the branding really does make it look like a proper bus again not the coach its been for so long. Looking very smart. And was proposed another Mercedes 709 could be bought in the very near future because of the unrelibility of M152 LPL. More on this also to come.